While there are many breeds of hypoallergenic dogs, if you are looking for a dog that is unique, then you may want to research hairless breeds. While many people believe these breeds are made up of small dogs, this is not always the case. Medium sized dogs can also be found. Four types of hairless breeds include: the Mexican Hairless, the American Hairless Terrier, the Chinese Crested, and the Peruvian Hairless. If you are considering buying one of these breeds, you may have to search for a breeder online as these dogs are not as common as other breeds of hypoallergenic dogs. The Mexican Hairless may be the most difficult hairless breed because there are very few breeders in the United States and in other countries. This breed has a short coat that will not need to be groomed or brushed because it is so short. This means that you will not have to worry about matting, or other issues concerning the care of the coat. The Mexican Hairless is available in different sizes, contrary to popular belief. The American Hairless Terrier is another breed that is not truly hairless. This breed also has a short coat that does not have to be groomed. Originally, an accident of nature discovered in 1972, breeders successfully reproduced other puppies in 1981 and have been selling them ever since. True to its Terrier roots, the American Hairless Terrier is a small, husky dog that is very friendly and outgoing. These dogs are great for those who are allergic to dogs and who live in small apartments or homes. The Chinese Crested is an unusual dog because it is available in two distinct varieties. The first variety is truly hairless except for long hair that grows on its paws, head, and tail. Grooming can be done by a professional or at home if you know what you are doing. The second variety called the powder puff and has long, fine hair that resembles human hair. Both varieties are considered to be hypoallergenic because these dogs do not shed too often. 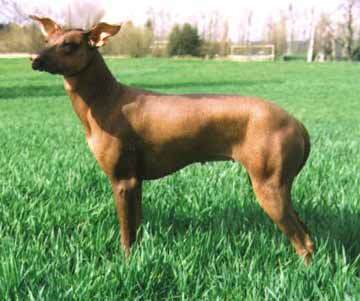 The Peruvian Hairless is truly hairless. This breed is medium in size and is intelligent and friendly to most people. This dog is not for those who have had no prior experience working with dogs. They need to be trained to follow commands and even though they are intelligent and learn quickly, they will not always obey. Hypoallergenic hairless dogs need exercise, crave attention, and enjoy being with their owners as much as other breeds. You will have to be careful when taking them outdoors because they get sunburnt easily and will require lotion when this happens. Since certain breeds can experience dry skin or acne, you may have to apply skin creams in order to reduce pain or itchiness. In order to find a breeder, you may have to search online because there are few breeders that breed hairless dogs simply because they are as popular as other breeds. If you can’t decide if a hairless dog is for you, visit those who have a hairless or visit the breeder to learn more.